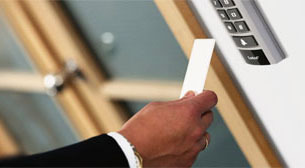 Advanced access control systems – are integral parts of integrated security systems. They are used for various problems solving – from automatic recording of working time to providing of multilevel access to the secret premises. Operation of access control system is based on reading codes from verifiers, keying in the codes and subsequent comparison with the data, recorded in the system memory for determining whether workers have a right to enter the premises and territory. Up-to-date access control systems open up possibilities both for security services and for accounting department of the enterprise, company management. New technologies allow prompt programming of mentioned systems for workers’ access right to some places, for counting working time with further payroll preparation, as well as for quick printing of passes, archiving of events etc. 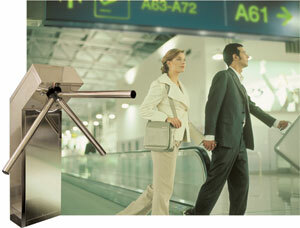 Mechanisms for access control – are electronic keys, turnstiles, bars etc. Magnetic cards, electronic keys, radio key rings, keyboards, fingerprints and retinas can be the keys. Modern access control systems, offered by the BK Company, allow to display on the security’s monitor the graphical plan of the premises, being under security surveillance and access points (doors, gates). Moreover, it is possible to integrate them with security systems and video control systems. By dint of information, received by the computer, it is possible to detect location of some persons, to estimate doors condition – is it opened or closed. While the worker passes through the access control point, the photo of this person, as well as image from video surveillance system can be displayed at the securities’ screen. Doors, bars and gates can be opened remotely by operator from the security console. During such operations, the event log is recorded on the computer hard disk. If complex approach, offered by the BK Company specialists, was executed, integration of access control system with systems of security alarm, perimeter security and video control makes technical protection of the object more effective and makes the operation of such systems cheaper.